2011, in kick starting IAOMAS back up in Western Australia, one of my ideas was to realise a National IAOMAS Conference. It was a brash and barefaced goal - for who am I really? I run the smallest garage dojang, and for many years I stayed clear of affiliations to any one group. So, only armed with dojang etiquette, the idea to network amongst other martial arts schools, and hat in hand, I embarked on my epic journey. The gathering of instructors during the commencement address of the 2014 National Australian IAOMAS Conference. Fast forward to present day Western Australia, I find myself with a small group of teenage student beginners, and one of the first pages I felt important to put up on my website is on Etiquette. Copying and pasting a good portion from other martial art websites, I make tweaks here and there to what quickly becomes a rather tedious document. It just seems to have so much information on deportment and decorum. I've always wanted to be known as a pragmatic applications-oriented combative technician. Yet, here I was prompting people to iron their pajamas, clean their feet, and bow. No wonder MMA people think there's this huge disconnect between the goals of traditional systems versus the laser focus of MMA training. This was when I had a brilliant idea to look at etiquette during its most romanticized era - and I discovered that in medieval times, etiquette covers a huge range of activities including combat. And as a list of what-to-do in various situations, helps ensure bravery in combat for knights, as well as their conduct in court. 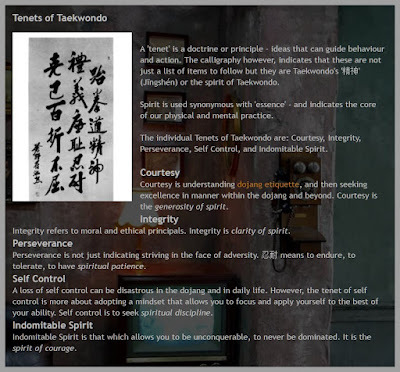 The etiquette guidelines I was working on also seemed a logical extension for the other recent addition to my site - The Tenets of Taekwondo. 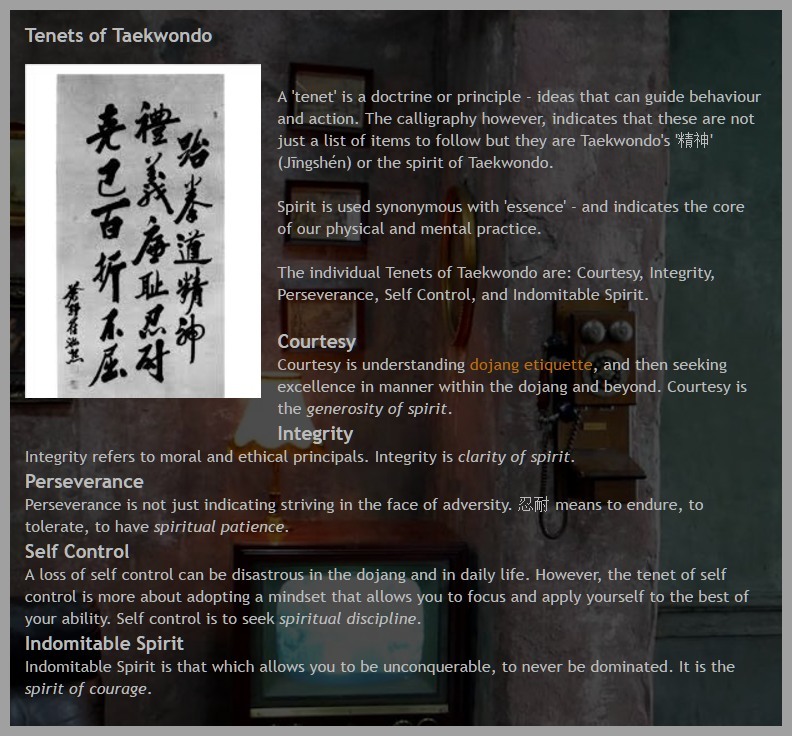 Though the English word 'tenet' meaning principle or doctrine, doesn't fully explain the characters for 精神 which mean spirit or essence - literally the 'core' of Taekwondo. So as the 'expanded list' or the extrapolation of the Tenets, I revisit my etiquette guidelines and start to look at issues other than courtesy, integrity, and perseverance. I venture into the areas of self control and indomitable spirit to look at how etiquette impacts the practitioner's readiness for combat. And so I start to build my etiquette guidelines to ensure proper use of Taekwondo as a physical system of combat. Yes, I know many would rather steer clear of the use of Taekwondo for physical self defence - it is of course way simpler to just avoid the fight, and perhaps the intellectual difficulty of justifying brute force. Self control to me is not just to prevent a person from losing control - most regular people don't have much of a problem with that. Self control is to establish discipline of the mind in order to maximise the focus for your training. It is to ensure you have long term dedication and not burn yourself out too quickly. Self control to me is also giving the student permission to become a vessel of their training - to respond with appropriate timing, distance, and power, when it has become necessary to do so. At another IAOMAS event - this time in 2017. Sigung Vincent Cordeiro leads a killer cool down exercise which causes my legs to scream in pain. Yet I don't move. Is this the only verification of my self control? Of course self control also goes hand-in-hand with the guideline that covers provocation, encouraging the practitioner to avoid, walk away, or deescalate. But in the end, when all that fails, the guidelines prompts students to "use Taekwondo to eschew unfairness and injustice" and then heralding back to Knights in shining armor, to "protect the weak and defenseless." The permission to do the right thing for the right reason and backed up with the right training is a gift of warriorship. It is the idea of the 'Warrior Gentleman' which is the present day extrapolation of Knights and their code of chivalry, which many believe is missing or emasculated from our educational system or the culture in a developed world. That tedious list of protocol? Really not much different to what you have learn after graduating from business school and then realizing the business world requires you to understand a litany of unwritten rules of where to sit, how to write, what to say, and who to carry. And what really is a burden is knowing those unwritten rules will chew you up and spit you out, they don't have your back, and they don't develop your indomitable spirit. In working on a published but early version of my Etiquette Guidelines, I received push back from a couple of black belt friends. 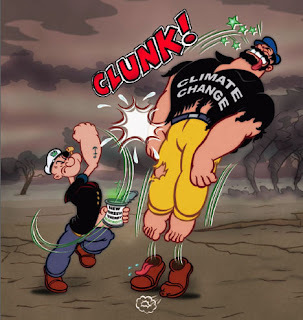 The general concern was that taken to extreme, the guidelines may force you to push yourself toward physical exhaustion in pursuit of perfection of character. While I argued the page is labelled 'guidelines' not rules, they highlighted to me the need to ensure that duty of care is paramount and a dose of common sense is very much needed. 2015 Ging Mo Free Form Fighting - Joshua gets hurt, wants to continue the fight, but officials believe it better to stop the match. As a group, we still celebrate his participation. We'd rather him not be hurt, but we've done what we set out to do, and he put on a brave front and good show. Again, this nurturing attitude is not a feature of MMA training. But no MMA training I've seen espouses the path of 道 or values the perfection of character. MMA fighters and combative practitioners - seem to make 道 a mutually-excluded feature of their practice. We don't. Which brings me back to my own practice. Counter to MMA banner shakers, the preservation of etiquette and the traditional training system I have sought to promote have allowed me to gain a measure of skill which I would not have thought possible after I left the US; especially not having direct training from my parent organisation in Dallas, Texas. Tradition. Etiquette. Protocol. The Tenets. All have allowed me to use the dojang and my continued practice to fully contemplate what has been taught to me of my art by my instructors and peers. I would certainly not be in the same place nor become the instructor I am now had I solely been trained for the spectacle of some boxing, a range of BJJ moves, or often poorly executed kicks done in the confines of a cage. It is difficult to convey the value of etiquette over its tedium. It is so much easier to 'go with the flow' and identify with the pop culture worship of trash talking, the need to define and laud the self, and to raise your worth by diminishing others. Until of course, people realize that they have obsessed in showing off so much about so little. For me? For the IAOMAS National Conference, I already knew I didn't have much to offer except my cheery self. I just saw that I had to take many baby steps to arrive at this very large destination. 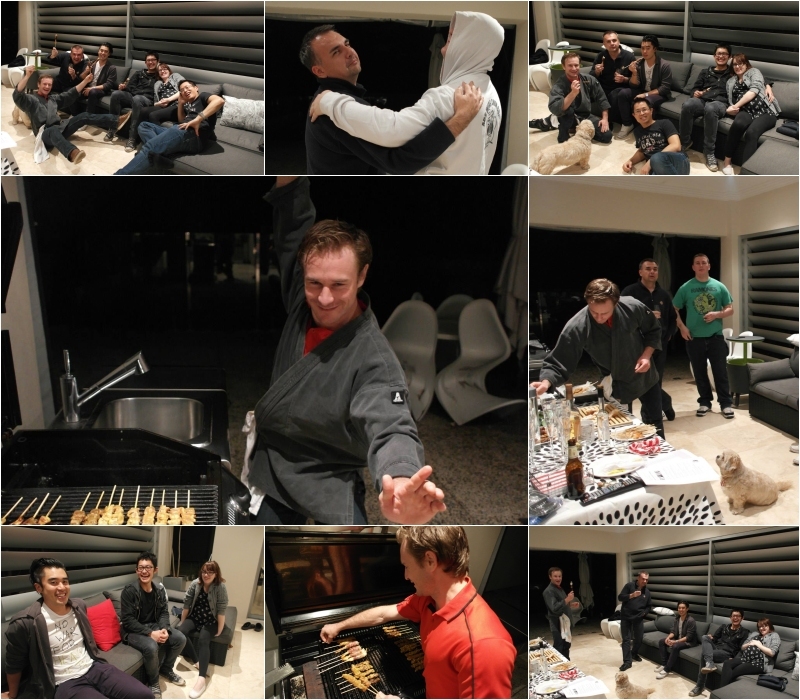 Eventually, this journey to organize what possibly was the best martial arts conference in Western Australia to date was only just another step on a path to meet and promote like-minded practitioners. For those who weren't there, in the 18-month lead up to the event, I coordinated multiple social events, had joint training amongst schools, hosted instructors at my dojang, engaged in constant social media interactions, and uploaded silly marketing videos of myself. That's the pre-conference barbecue at my place - originally designated for out-of-towners, but most would arrive in Perth on the day of the conference itself. Nevertheless we had a motley crew and had a good time. But my real kung fu started to show as the date loomed closer. Out of the woodwork people started having their own ideas of how the conference had to be organized. This was where etiquette and The Tenets came into their own. I had to be able to pitch ideas, accept feedback, but sometimes continue with what I believed was needed for a successful event. And I had to do this whilst bringing together 70 practitioners, some of whom may not see eye-to-eye on various issues in the martial arts. Etiquette to me is not there to create a cult following amongst my students nor engage in politics amongst other practitioners. It is not a trick for me to establish power asymmetry. It is there to build a safe and nurturing environment, to practice in harmony with peers, to value character development, and then to have deportment befitting a confident and well adjusted person. This all is the 道 of Taekwondo, and people who value it regardless of their art, relate to it. The old men of martial arts (and some klingons) in Western Australia hang out after IAOMAS Masters - a closed door continuing professional development event held in my garage. Many of these gentleman have distinguished martial arts careers, are highly accomplished practitioners, and are busy tending to their own schools. YET they willingly come train in my humble garage with other stylists. How does this happen? I invite one and all to visit my website at www.joongdokwan.com - there is a link to the Etiquette Guidelines at the bottom of the About Page. I would be very happy to receive your advice and feedback on how to improve these guidelines in the spirit of the Tenets of Taekwondo. Until then, train safely. 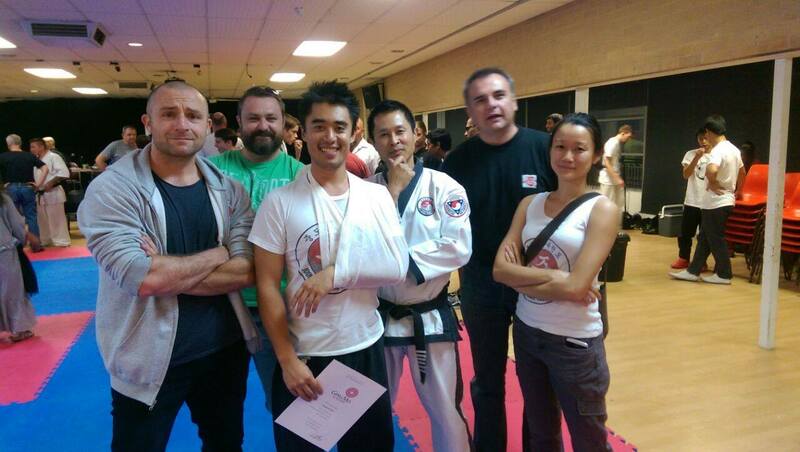 Colin earned his first black belt in an eclectic Chinese/Korean system out of South East Asia in 1987. He then joined American Karate and Taekwondo Organization of Dallas, Texas in 1991 where he has trained in and subsequently promotes Traditional Taekwondo from GM Keith Yates' AKATO and Nam Seo Kwan Taekwon Do lineage. Colin's research into Traditional Taekwondo, his continuing video series shared with international instructors on The Study of Taekwondo/태권도의 공부 Secret FB Group, and his groundbreaking work with Joong Do Kwan, all comprise some of the most contemporary commentary on traditional Taekwondo hyung available today. How this came about? Colin's simple aim was to restore Taekwondo's links to older systems like those in Okinawa and China, and then to benefit from modern innovations in the sport. Note: This article was submitted to Totally Taekwondo Magazine in June 2017.